Cook linguine according to package directions. During the last 4 minutes of cooking, add broccoli to water. 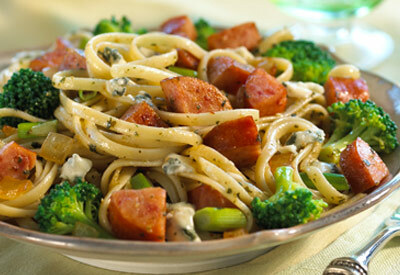 When linguine and broccoli are tender, drain; keep warm. Heat a 4 to 6 quart pan over medium-high heat for 3 minutes. Add sausage and onion to pan; cook 3 to 4 minutes, stirring occasionally until sausage is browned and onion is tender. Add hot sauce, cooked linguine and broccoli. Toss gently over medium heat for 1 minute. Stir in pesto, Gorgonzola and green onions; heat through. Add salt and pepper to taste.